In a world where we rely on cloud applications for so many of our daily activities, having the ability to make them all talk to each other is essential in order to prevent duplication of work, or data. Much of the software we use comes with the ability to connect it to other programs via an API, which is brilliant, provided you’re a programmer, app developer or some other kind of super geek! Sadly the average office technician or even the most tech savvy VAs amongst us don’t have these skills. Then along came Zapier! This wonderful tool suddenly opens up a whole new world for the average business user, allowing you to automate actions between your online applications. 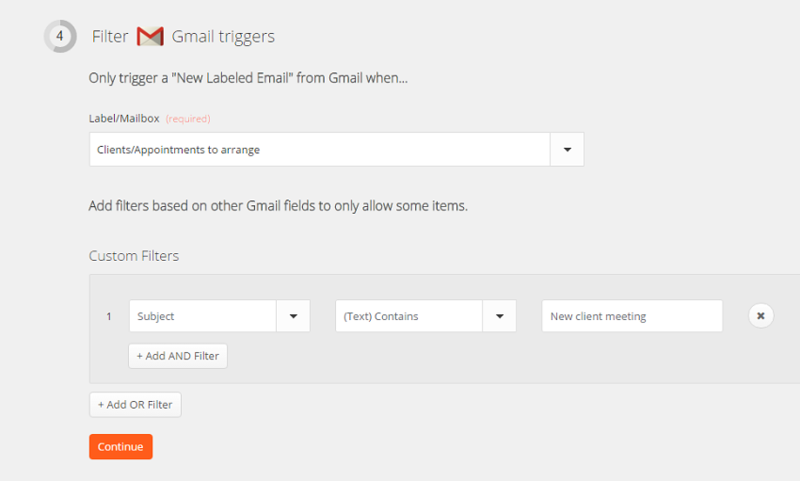 You can make Gmail talk to Xero, or your calendar connect with your CRM system. In simple terms, Zapier uses a trigger in one application to carry out an action in another application and with a little bit of common sense, it’s easy enough for most people to use. This will open a page where you can pick your trigger and your action. 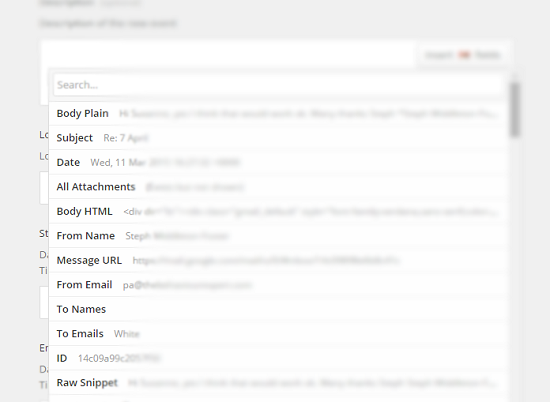 You can see here I have selected Gmail as the Trigger application and the trigger is ‘new labelled email‘. This means that when a certain label is applied (which I can specify later on) this will be the trigger for the action that we’ll specify next. 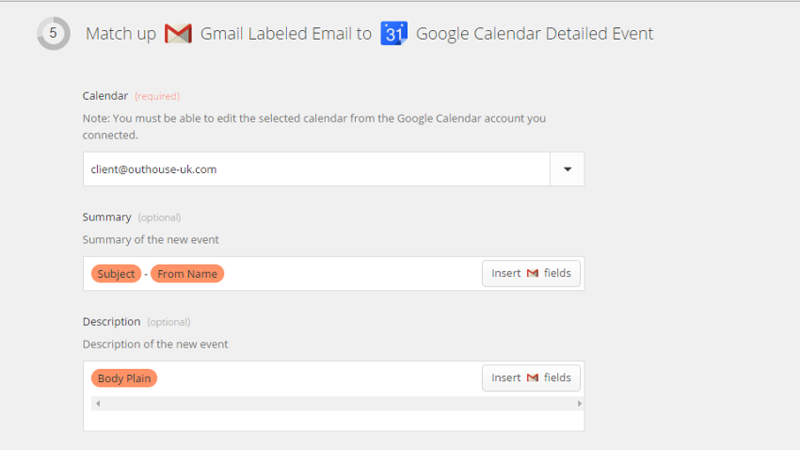 In this example I have set the Action application as Google Calendar and the action as ‘create new event‘. Next you need to connect up the first application. Either choose an existing account from the list (if you have previously set up accounts for that particular app) or choose ‘connect a new account’ to add a new one. Once connected up, use the ‘test account’ button to check you’ve connected it successfully. If you’re not sure what’s possible, or for specific help, you can check out the Zapier help section which has plenty of information. When you’re happy, click continue and this will then allow you to connect the action application in exactly the same way. In the next step, you can then setup filters so that only some triggers will trigger the zap. In this case, I have a particular label called ‘Appointments to arrange’ – I only want calendar events to be created when this label is added in Gmail. In addition, you can use custom filters to further segment your triggers. For example I might want appointments to only be created for emails sent by a certain person, or with a certain subject line, such as ‘new client meeting‘. Some triggers have pre-existing filters you can choose from a drop-down, and you can also choose a custom filter. With custom filters you can have multiple values and use both ‘AND’ ‘OR’ criteria giving you a huge choice of fully customisable options for your filter. When you’re happy with your filters, click continue. 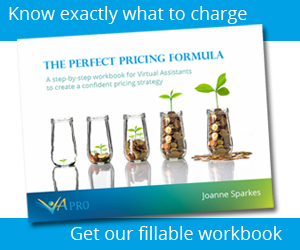 This is where you create your action, by mapping the fields from your trigger to the action you want to happen. Depending upon the application you have chosen, your options will be different, and relevant to your account. Click the ‘insert field‘ button to the right of each option box to choose existing fields from your application. You can add multiple fields in this section and can combine it with free text too. When it comes to dates, Zapier is a clever little thing! It can interpret dates in many formats, such as ‘tomorrow at 12pm’ or ’18th may 2.30′. This means that for my date field (which is required) I am going to map it to the body text of my email. As long as the date and time of the meeting is in the body text, this will be used to create the event in my calendar – clever, huh?! Notes: remember that anything you type into the fields as text (rather it being a dynamic ‘placeholder’) will appear in every action that occurs. If a field is required, then you must add a value for it, in order to prevent it returning an error. Repeat this process for every field that is available for your application the click continue. You’ll then get the option to test your newly created zap using live data from your application. this allows you to make sure everything is working before you set it live. The final step is then just to give your Zap a name and turn it on! Then sit back, grab a cuppa and watch in amazement as all your little routine jobs happen by magic, saving you valuable admin time and eliminating the chance of a forgotten appointment ever again! Do you use Zapier? What’s your favourite automation? We’d love to know what the best time saving zaps are for VAs so don’t forget to comment below and let us know. Previous articleAre You Missing This SEO Trick?